Cantuccini are traditional Christmas biscuits originating from Tuscany. 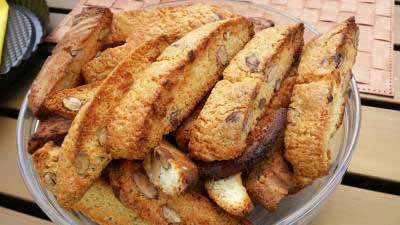 Technically, these can be called Cantucci or Cantuccini biscuits as ‘biscotti’ refers to all biscuits in Italian. Why not try out this classic Tuscan recipe from our cooking holidays, best enjoyed dipped in a glass of Vin Santo! This blog was originally posted on 12th August, 2015 and was updated on 15th December, 2017. Heap the flour and sugar together on a wooden board and mix well. Make a well in the middle. Add 3 eggs to the well with a pinch of salt. Using a fork, mix the eggs in the middle slowly, adding the flour and sugar around the edges. Add the baking powder and continue to mix together until a dough starts to form. Then start kneading with your hands. Chop almonds quite finely and add to mixture. Add extra flour to stop the dough sticking to the board if necessary. Form the dough into a log shape and slice into 6 equal pieces. Roll and flatten the pieces to form strips 3 fingers wide and 1 finger high. Line an ovenproof dish with greaseproof paper and place the strips in the dish, a good distance apart from each other. Cover the dish and leave at room temp for 30mins. Once rested, brush each piece with egg and bake at 180°C. After 30 minutes, remove from the oven and slice into diagonal pieces then spread the pieces and put back in the oven for 15 minutes at 190°C. Cantucci are biscotti, which literally means cooked twice. These biscuits are great dipped in sweet dessert wine (Vin Santo), or you can try them with coffee or tea.